Looking for an easy-to-install UHF antenna for city or suburban use? The compact HDB2X sets up quickly and gives you outstanding reliability in a small, light package. There’s a lot of free HDTV being transmitted from the local TV station transmitters in your area. Make sure you get the most local channels by getting the strongest TV antenna you can buy, the Xtreme Signal series. If you are more than 35 miles from your closest broadcast towers, you will appreciate the sheer power of the HDB2X. This TV antenna is the best choice for people who live in apartments and condos. Homeowner’s associations must allow any antenna under 39” to be put up in a private space, which means that they can’t stop you from mounting your HDB2X. If you live in the suburbs, you’ve probably see gigantic, bent antenna masts on many homes. The world has changed since the 1950s, and you don’t need those big metal eyesores to get great reception. 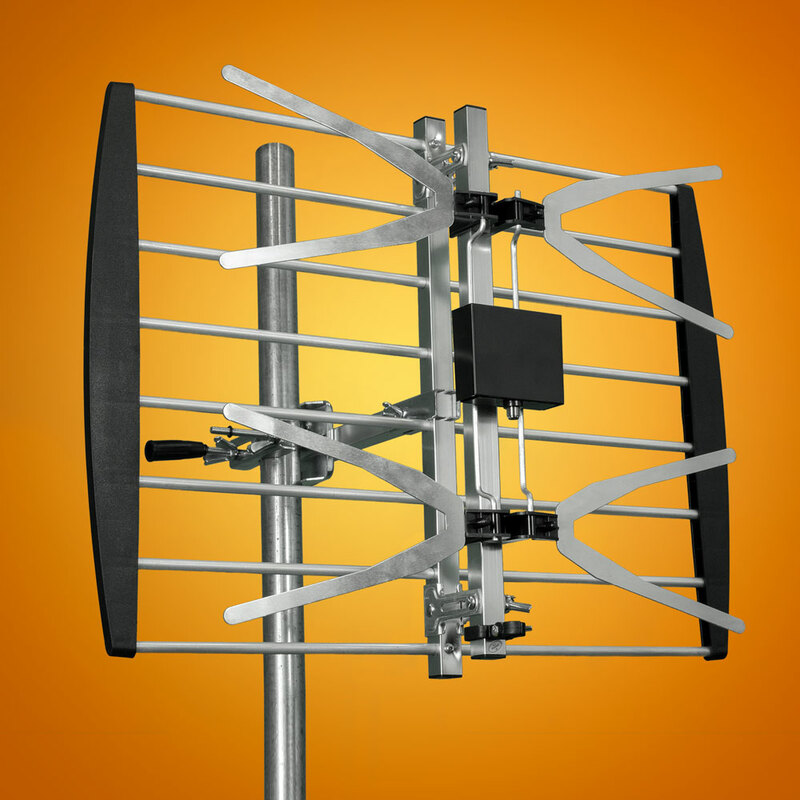 Check out the HDB2X Xtreme Series HDTV antenna for power and style. Free television is an option that most of us have forgotten about. We’ve all been paying the cable companies so long that it’s hard to remember why we stopped getting all our channels over the air. Even though cable has been around for 30 years, nine of the top 10 shows are still found on antenna TV, which is 100% free! It’s time to get the free TV you deserve. The HDB2X from Xtreme Signal is the best choice for you because it combines the power of an “old-school” antenna with 21st century style. It pulls in UHF channels in stunning, high definition reception. This durable, high-tech TV antenna is just as powerful as those antennas from days gone by! Choosing an outdoor TV antenna like the HDB4X gives you the option to permanently mount and aim your HDTV antenna for the best possible signal. The sturdy yet light construction of the HDB4X offers many mounting options. Whether you want to strap it to an existing vertical surface or put up a mast just for this antenna, you’ll find installation is easy. If you need help, our Xtreme Signal team will answer your questions.